Breast cancer cell lines are invaluable models for a greater understanding of the genetic profile, molecular biosciences, biologic nuances and drug therapy development of the disease. Mouse xenograft studies routinely utilize cancer cell lines aiming to assess the efficacy of antitumor treatments. The MDA-MB-468 cell line was derived in 1977 by R. Cailleau from a pleural effusion of a 51-year-old female with breast adenocarcinoma. The MDA-MB-468 triple-negative cell line is commonly employed in oncology research for the study of metastasis and invasion of breast cancer. According to a 1994 study in Cancer Research, one of the main characteristics of the MDA-MB-468 cell line is the presence of a single p53 allele that harbors a point mutation at codon 273. A 2014 Cell Press article (Mason et al.) used the MDA-MB-468 model to identify CFI-400945, a polo-like kinase 4 (PLK4) inhibitor, as a candidate for clinical evaluation due to well-tolerated toxicity and inhibition of tumor growth via dysregulated mitosis and subsequent apoptosis. Hugo et al. released data in 2017 using MDA-MB-468 to demonstrate the oncogenic properties of E-cadherin, previously thought to be a tumor suppressor. Downregulation of E-cadherin had been associated with decreased proliferation and subsequent epithelial-to-mesenchymal transition (EMT), a process necessary for metastasis; upon establishment of secondary metastases proliferation is restored via the reverse process of mesenchymal-to-epithelial transition (MET). This study presented findings suggesting the promotion of primary breast cancer cell growth and metastases formation by E-cadherin via supporting MET, effectively calling for a reevaluation of E-cadherin’s status as a tumor suppressor. A 2010 Clinical Cancer Research article (Bartholomeusz et al.) used a MDA-MB-231 xenograft model to establish the potential of PEA-15 as a therapeutic target; this group found that overexpression of PEA-15 inhibits tumorigenesis, reduces DNA synthesis and induces caspase-8-dependent apoptosis through increased intracellular levels of activated extracellular signal-regulated kinase. Finally, Kil et al. (2014) used the MDA-MB-468 xenograft model to verify that silibinin, a compound that inhibits tumor proliferation and induces cell cycle arrest, does have an anticancer effect on triple negative breast neoplasms; they reported the mechanism of action for silibinin effect is through preventing EGFR phosphorylation and suppressing expression of COX-2, VEGF AND MMP-9. The MDA-MB-468 cell line is used to create the CDX (Cell Line Derived Xenograft) MDA-MB-468 xenograft mouse model. 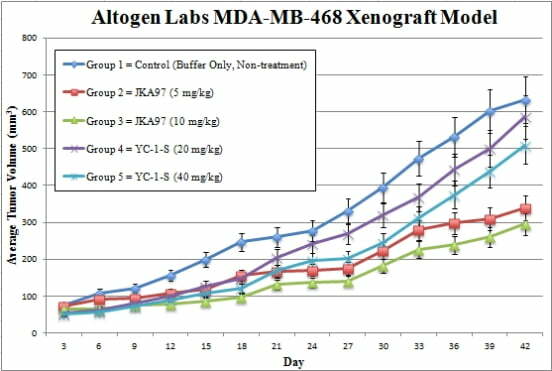 The MDA-MB-468 xenograft model is a triple negative model that can be used to study the efficacy of tumor growth inhibitors (e.g. silibinin, paclitaxel, PEA-15). Post collection from flasks, MDA-MB-468 cells used for injection must maintain 98% cell viability determined by trypan blue exclusion. The cell suspension is adjusted such that each mouse (athymic BALB/C or NOD/SCID, 10-12 w.o.) will receive a single, subcutaneous (s.c.) injection into the hind leg containing one million cells. The injection volume is 100 µL of the Matrigel plus MDA-MB-468 suspension. Tumors are then measured with digital calipers until an average size of 50-150 mm3is reached to begin the study. Animals are randomized (based on common techniques) into treatment cohorts. Administration of all test compounds is performed following the client supplied treatment schedule. Tumors are continually measured and mouse weights recorded (up to 3 times a week). At study completion, animals are euthanized humanely. Collected tissues are performed as defined for termination of experiment and are snap frozen, fixed for histology or isolated for gene expression analysis. Tumor samples are weighed and imaged (digital option). Altogen Labs provides an array of laboratory services using over 30 standard Cell Line Derived Xenograft (CDX) models and over 20 PDX models. Researchers investigating the role of specific proteins or gene products in regulating tumor growth can benefit from development of protein overexpression (genetically engineered to ectopically express proteins, tumor suppressors, or oncogenes) and RNAi cell lines with long term gene silencing. Altogen Labs provides quantitative gene expression analysis of mRNA expression (RT-PCR) and protein expression analysis using the WES system (ProteinSimple). The dosing of the experimental compound of interest is initiated, for a staged study, when the mean tumor size reaches a specified volume (typically 50-100 mm3). In an unstaged study, the dosing of the compound of interest is initiated immediately after xenografting. Mice are dosed once or twice a day for 28 days (or other desired study duration) via the chosen route of administration. Tumor volume (mm3) is calculated via the “(W x W x L) / 2” formula, where W is tumor width and L is tumor length. Xenograft animal models are used to assess the effectiveness of drugs against specific types of cancer. New medicines are tested on staged tumor growths that have been engrafted via subcutaneous or orthotopic inoculation in an immunocompromised mouse or rat model. All clinically approved anti-cancer agents have been evaluated with conventional preclinical in vivo models. Xenograft studies can be highly complex, starting with the selection of the appropriate animal model, choice of tumorigenic cell line, administration method, dosing, analysis of tumor growth rates and tumor analysis (histology, mRNA and protein expression levels). Animal handling and maintenance at the Altogen Labs facility is IACUC-regulated and GLP-compliant. Following acclimation to the vivarium environment, mice are sorted according to body mass. The animals are examined daily for tumor appearance and clinical signs. We provide detailed experimental procedures, health reports and data (all-inclusive report is provided to the client that includes methods, results, discussion and raw data along with statistical analysis). Additional services available include collection of tissue, histology, isolation of total protein or RNA and analysis of gene expression. Our animal facilities have the flexibility to use specialized food or water systems for inducible gene expression systems. Please send the details of your project to info@altogenlabs.com, or call 512-433-6177 and we will be happy to provide an immediate price quote. Experimental details will help us provide an accurate quote and timeline estimate.